"Don't play with your food" is a saying that MIT researchers are taking with a grain or two of salt. The team is finding ways to make the dining experience interactive and fun, with food that can transform its shape when water is added. 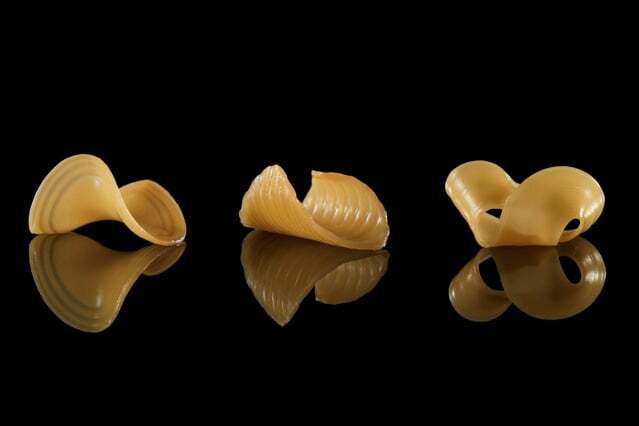 The researchers, from MIT's Tangible Media Group, have concocted something akin to edible origami, in the form of flat sheets of gelatin and starch that, when submerged in water, instantly sprout into three-dimensional structures, including common pasta shapes such as macaroni and rotini. The edible films can also be engineered to fold into the shape of a flower as well as other unconventional configurations. Playing with the films' culinary potential, the researchers created flat discs that wrap around beads of caviar, similar to cannoli, as well as spaghetti that spontaneously divides into smaller noodles when dunked in hot broth. The researchers presented their work in a paper this month at the Association for Computing Machinery's 2017 Computer-Human Interaction Conference on Human Factors in Computing Systems. They describe their shape-morphing creations as not only culinary performance art, but also a practical way to reduce food-shipping costs. For instance, the edible films could be stacked together and shipped to consumers, then morph into their final shape later, when immersed in water. "We did some simple calculations, such as for macaroni pasta, and even if you pack it perfectly, you still will end up with 67 percent of the volume as air," said Wen Wang, a co-author on the paper and a former graduate student and research scientist in MIT's Media Lab. "We thought maybe in the future our shape-changing food could be packed flat and save space." Wang's co-authors are Lining Yao, lead author and former graduate student; Chin-Yi Cheng, a former graduate student; Daniel Levine, a current graduate student; Teng Zhang of Syracuse University; and Hiroshi Ishii, an MIT professor in media arts and sciences. "This project is the one of the latest to materialize our vision of 'radical atoms' combining human interactions with dynamic physical materials, which are transformable, conformable, and informable," Ishii said. At MIT, Wang and Yao had been investigating the response of various materials to moisture. They were working mostly with a certain bacterium that can transform its shape, shrinking and expanding in response to humidity. Coincidentally, that same bacterium is used to ferment soybeans to make a common Japanese dish known as natto. Yao and Wang wondered whether other edible materials could be designed to change their shape when exposed to water. They started playing around with gelatin, a substance that naturally expands when it absorbs water. Gelatin can expand to varying degrees depending on its density—a characteristic that the team exploited in creating their shape-transforming structures. Yao and Wang engineered a flat, two-layer film made from gelatin of two different densities. The top layer is more densely packed, and thus able to absorb more water, than the bottom. When the entire structure is immersed in water, the top layer curls over the bottom layer, forming a slowly rising arch. The researchers looked for ways to control where and to what degree the structure bends, so that they might create different three-dimensional shapes from the gelatin sheet. They eventually settled on 3-D printing strips of edible cellulose over the top gelatin layer. The cellulose strips naturally absorb very little water, and they found that the strips could act as a water barrier, controlling the amount of water that the top gelatin layer is exposed to. By printing cellulose in various patterns onto gelatin, they could predictably control the structure's response to water and the shapes that it ultimately assumed. Wang and Yao created a number of different shapes from the gelatin films, from macaroni- and rigatoni-like configurations, to shapes that resembled flowers and horse saddles. 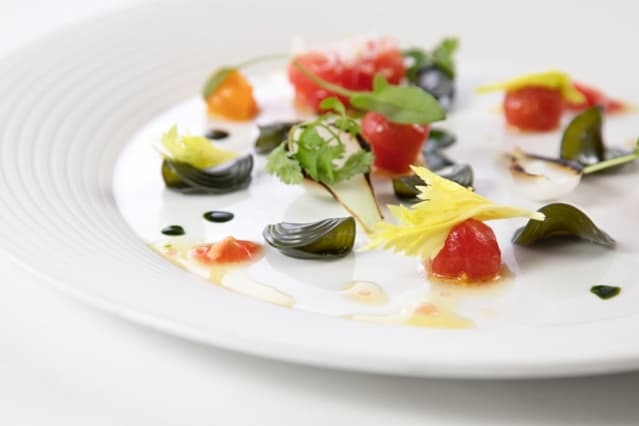 Curious as to how their designs might be implemented in a professional kitchen, the team showed their engineered edibles to the head chef of a high-end Boston restaurant. 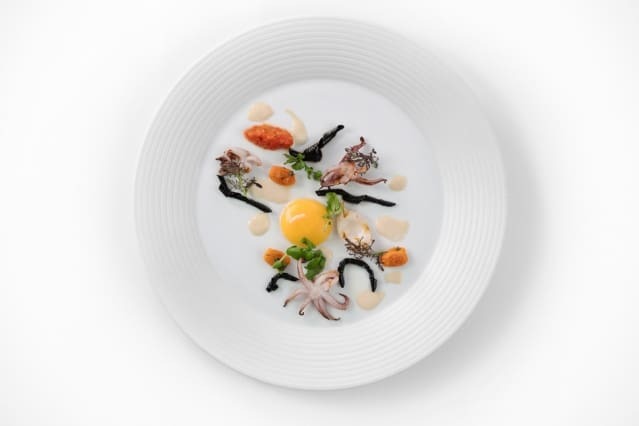 The scientists and chef struck up a short collaboration, during which they designed two culinary creations: transparent discs of gelatin flavored with plankton and squid ink, that instantly wrap around small beads of caviar; and long fettuccini-like strips, made from two gelatins that melt at different temperatures, causing the noodles to spontaneously divide when hot broth melts away certain sections. "They had great texture and tasted pretty good," Yao said. The team recorded the cellulose patterns and the dimensions of all of the structures they were able to produce, and also tested mechanical properties such as toughness, organizing all this data into a database. Zhang and Cheng then built computational models of the material's transformations, which they used to design an online interface for users to design their own edible, shape-transforming structures. "We did many lab tests and collected a database, within which you can pick different shapes, with fabrication instructions," Wang said. "Reversibly, you can also select a basic pattern from the database and adjust the distribution or thickness, and can see how the final transformation will look." The researchers used a laboratory 3D printer to pattern cellulose onto films of gelatin, but they have outlined ways in which users can reproduce similar effects with more common techniques, such as screenprinting. "We envision that the online software can provide design instructions, and a startup company can ship the materials to your home," Yao said. "With this tool, we want to democratize the design of noodles." For more on 3D printed food, find out what a Jell-O shot machine and 3D printing have in common.